^ 2.0 2.1 2.2 Means (1932). ^ 4.0 4.1 MacQuarrie (2007). ^ Jay O. Sanders. The Great Inca Rebellion. [30 June 2010]. ^ Jane Penrose. Slings in the Iron Age. 2005 [30 June 2010]. ISBN 978-1-84176-932-5. Bauer, Brian S. Pacariqtambo and the Mythical Origins of the Inca. Latin American Antiquity. 1991, 2 (1): 7–26. JSTOR 971893. doi:10.2307/971893. Covey, R. Alan. Inka Administration of the Far South Coast of Peru. Latin American Antiquity. 2000, 11 (2): 119–138. JSTOR 971851. doi:10.2307/971851. Gibson, Charles. Conquest, Capitulation, and Indian Treaties. The American Historical Review. 1978, 83 (1): 1–15. JSTOR 1865900. doi:10.2307/1865900. Hemming, John. Conquest of the Incas. New York: Harcourt. 1970. ISBN 0-15-122560-5. Innes, Hammond. Conquistadors. New York: Alfred A. Knopf. 1969. Kubler, George. The Behavior of Atahualpa, 1531–1533. The Hispanic American Historical Review. 1945, 25 (4): 413–427. JSTOR 2508231. doi:10.2307/2508231. Kubler, George. The Neo-Inca State (1537–1572). The Hispanic American Historical Review. 1947, 27 (2): 189–203. JSTOR 2508415. doi:10.2307/2508415. Lovell, W. George. 'Heavy Shadows and Black Night': Disease and Depopulation in Colonial Spanish America. Annals of the Association of American Geographers. 1992, 82 (3): 426–443. doi:10.1111/j.1467-8306.1992.tb01968.x. Macquarrie, Kim. 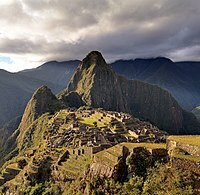 The Last Days of the Incas. New York: Simon and Schuster. 2007. ISBN 978-0-7432-6049-7. Means, Philip A. Fall of the Inca Empire and the Spanish Rule in Peru, 1530–1780. New York: Scribner. 1932. Newson, Linda A. Indian Population Patterns in Colonial Spanish America. Latin American Research Review. 1985, 20 (3): 41–74. JSTOR 2503469. Seed, Patricia. 'Failing to Marvel': Atahualpa's Encounter with the Word. Latin American Research Review. 1991, 26 (1): 7–32.